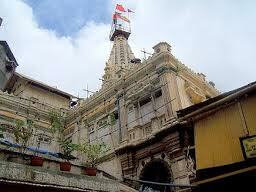 Here is Some Information about Mumba Devi Temple in Mumbai Maharashtra India. Visiting Timing : 30 Min. 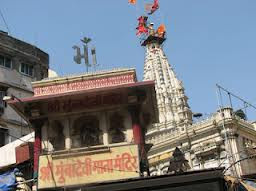 Mumba Devi Temple is the most famous shrine of Mumbai. 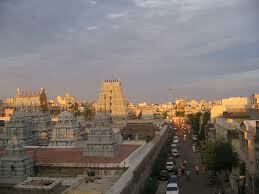 It is situated at Bhuleshwar, in the southern part of the Commercial Capital of India. The temple is dedicated to Goddess Mumba, who is considered as the patron deity of Koli fishermen - the first inhabitants of Bombay city. The Goddess is identified as the form of 'Shakti' and is worshipped by people with the utmost devotion. 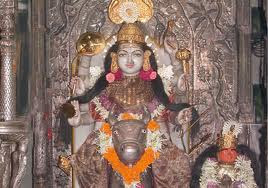 The benevolent Goddess Mumba, is dressed in silver robes and is ornamented with nose studs. 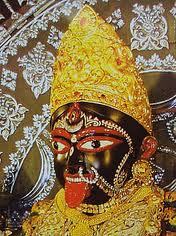 She is the presiding deity of Mumbai. Mumba is a goddess who has no mouth and her face is orange colored. This may be a significant representation of the Mother Earth. She is worshiped with great devotion by the fisher folk called Koli. 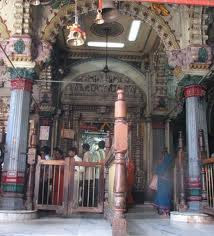 In the Mumbadevi Temple, apart from the image of the Goddess MumbaDevi there also resides idols of Ganesh Indra, and Hanuman. 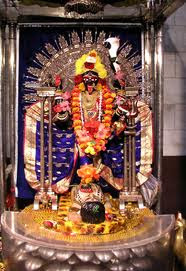 It is believed that the Maa Mumba does not let down any of her devotees if they are sincere while offering their prayers. On Mondays the temple remaines closed. Outside thetemple of Devi Mumba, there are stalls, which sell flowers, garlands and other things needed for offering 'puja'. Jasmine, pink lotuses and orange marigolds are some offerings, which is considered auspicious and lucky by her devotees. This temple was built in honour of the Goddess Mumbai, from whose name it is said, that the English word 'Bombay' is derived. 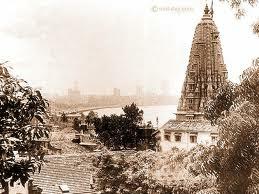 The Mumbadevi temple is six centuries old. The first Mumbadevi temple was situated at Bori Bunder, and is believed to have been destroyed between 1739 and 1770. After the destruction a new temple was erected at the same place at Bhuleshwar. The Goddess personifies Mother Earth and is still worshipped by the descendants of the Dravidian population of western and southern India. The original temple built at the site where the Victoria Terminus station earlier was by Koli fishermen was demolished around 1737 and a new temple was erected in its place at Phansi Talao. The modern shrine contains an image of the Goddess Mumbadevi dressed in a robe with a silver crown, a nose stud and a golden necklace. To the left is a stone figure of Annapurna seated on a peacock. In front of the shrine is a tiger, the carrier of the Goddess. 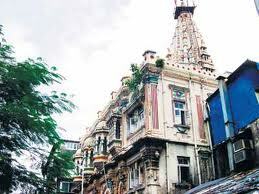 Mumbadevi Temple dedicated to city's patron Goddess Mumbadevi is located in Bhuleshwar, Mumbai. She is considered as Mumbai's resident deity. The temple of Mumbadevi once stood on the site of the present Victoria Terminus in the central island. 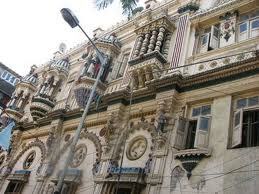 The present name of the city is derived from the Goddess Mumbadevi. The temple itself is not impressive but is an important landmark as it is dedicated to MumbaDevi, the city's patron deity. It is from her that Bombay gets its local name Mumbai. 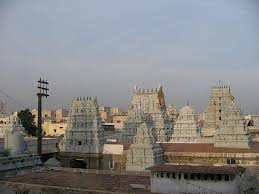 According to a popular legend the structure of the temple is about six centuries old and it is believed be the handiwork of Mumbaraka, a sadistic giant who frequently plundered the city at the time. Terrorized by these unwelcome visits, the locals pleaded with Lord Brahma, Creator of all things to protect them. Brahma then "pulled out of his own body", an eight armed goddess who vanquished the Mumbaraka. Predictably brought to his knees, Mumbaraka implored Her Holiness to take his name and built a temple in her honour. She still stands there, an orange faced goddess on an altar strewn with marigolds: devotees believe that those who seek her divine favour are never disappointed. 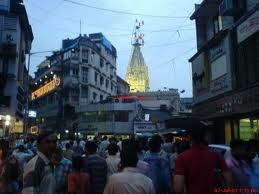 Crawford Market situated nearby is famous for its fresh vegetables, fruits and meat. The Chowpatty Beach, a hot tourist destination, is located at the Northern end of Marine Drive so if you are looking for some solitude, you might want to head to the beach after the temple aarti. 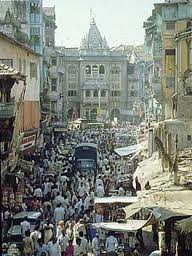 By Road:One can hire auto-rickshaws or taxis to Bhuleshwar where the Mumba Devi Temple is located. By Rail:One can reach Mumba Devi Temple easily by boarding local trains from the city. The Charni Road Station is only 10 minutes from Bhuleshwar. Churchgate Station is also located close to Bhuleshwar. By Air : Through Airways the city of Mumbai is a most important international doorway to India with international flights from major countries of the world. Air India and many other global air carriers operate regular flights to and via the city. Indian Airlines connects the city of Mumbai with nearly all tourist destinations of India. Private sector airlines also offer air-link to many key centres of the country. The Mumbai airport has two wings which are Chhatrapati Shivaji international Airport and Santacruz domestic airport. Here is some information about Swaminarayan Akshardham Temple in Ghandhinagar Gujarat India. Temple: Daily 9:30a.m. to 7:30p.m. Night Lighting : On Saturdays, Sundays. Exhibitions : Daily 10:00a.m. to 6:00p.m. Rides & Games : 12:00 noon to 8:00p.m. 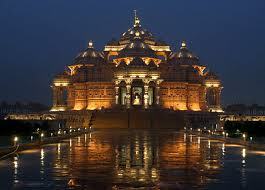 Swaminarayan Akshardham Temple is an architectural phenomenon that is recounting the cultural heritage of India. 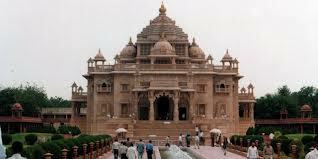 Having one of the largest temple complexes in Gujarat, Akshardham is a wonderful shrine located in the heart of Gandhinagar. The magnificent monument is easily accessible by the local means of transport available in the city. 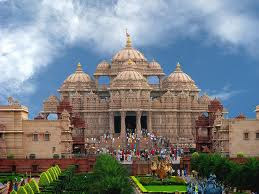 Predecessor to Akshardham at Delhi, the temple was constructed by the same organization BAPS (Bochasanwasi Shri Akshar Purushottam Swaminarayan Sanstha) with the blessings of Pramukh Swami Maharaj. 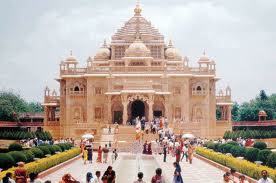 In Nov' 1992, Akshardham Mandir was inaugurated by Pramukh Maharaj himself, the promoter of BAPS. 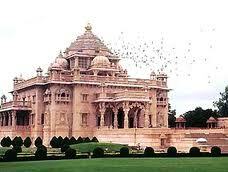 In the present day, Akshardham Temple has become a major and popular attraction amongst the devotees and tourists. 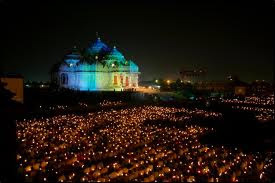 Prolific effort of BAPS, Akshardham Temple is a center to encourage art, culture and values of India. 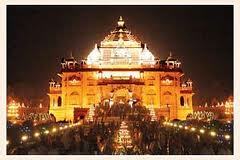 Akshardham is an excellent specimen of Indian roots, where art is ageless, culture is borderless and values are changeless. The sanctum sanctorum embraces the seven feet tall, gilded image of Lord Swaminarayan. 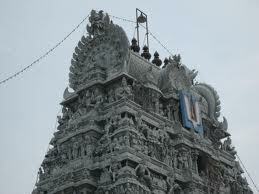 Hari Mandapam, Prasadi Mandapam and Vibhuti Mandapam are name allotted to the different floors. These floors embrace various sections, where people are engaged in the selfless service to the Lord. The main idea behind these programs is to introduce people with the philosophy of Lord Swaminarayan. The aim of BAPS' is to educate people about the rich spiritual and cultural roots of India. 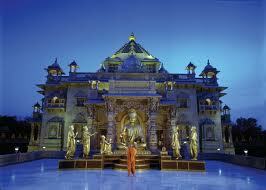 Designed on the lines of Sthapatya Shashtra, Swaminarayan Akshardham is the paradigm of silence and peace. 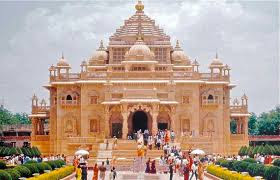 Akshardham presents a perfect blend of devotion, art, architecture, education, exhibitions and research at one venue. In the temple complex, 'Sahajanand', 'Sat-Chit-Anand' and 'Nityanand' are three permanent exhibition halls that are made to enlighten the visitor on spiritual matters. Intricately carved, the majestic Monument made of 6,000 tons of pink sandstone is awash with spiritual stillness. 7 ft. Gold-leafed Murti of Lord Swaminarayan. The Monument exudes warmth and peace, and serves as a fountain of peace. Floor area : 12,997 sq.ft ( 1,207.9 sq.m ). Revelations of the Lord, displayed in exquisitely-lit brass lotuses. Each revelation is a deep yet practical treatise on philosophy. Floor area: 8,033 sq.ft ( 7 46.6 sq.m ). Display of holy relics of Lord Swaminarayan. Floor area: 11,397 sq.ft ( 1,059.2 sq.m). Visitors to the Monument are requested to remove shoes and observe silence. The life of Lord Swaminarayan is experienced through amazing settings and shows. Floor area: 21,817 sq.ft (2,027.7 sq.m). Attractions: Travel in time through a video show, Fiber-optics cosmos, Mini Chhapiya village, Journey through India, 3 light & sound shows. Mystic India rediscovers India, a land of many mysteries and fascinations. A period film set 200 years back in time, it retraces the incredible journey of an 11-year old child yogi, Neelkanth. Floor area: 9,421 sq.ft ( 875.6 sq.m ). Attractions: An epic journey into the land and soul of India. This entertaining, educating and enlightening film was made originally in giant screen format. Walkthrough dioramas and fiberglass figures display the messages of Upanishads, Ramayan and Mahabharat. Attractions: Palace of Hastinapur from the Mahabharat, Gurukul in nature's lap, Songs of saint-poets, Harmony of world religions. A superb audio-animatronics show brings to life the atmosphere, characters and events from over 200 years ago to reveal the key to eternal happiness. The Sahajanand Vun is a unique blend of contemplative garden and children's park. Floor area: 645,600 sq.ft (60,000 sq.m, 14.8 acres). 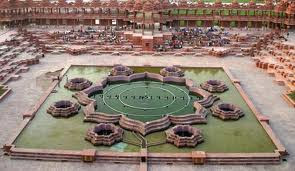 Attractions: Cultural spots, Rides and games for children, Single-piece marble sculpture of Lord Swaminarayan, Lake and waterfalls, Herbal garden. The Sat-Chit-Anand Water Show reveals India’s ancient secret of inner light through an Upanishadic story of Nachiketa, a nine year old boy, who bravely confronts Yamraaj, the God of Death, and receives from him the knowledge that has made India, a land of enlightenment. A futuristic research center with a rich library, study stations and archives. Accessibility to the library has been reserved for enlisted scholars. Free wheelchairs are available on a need-based priority at the main reception counter. One assistant is expected to attend the disabled and return the wheelchair. For security measures baggage is not allowed inside the complex. Claim or report lost property at the main reception counter. The authorities cannot be held responsible for stolen or damaged properties. Ample parking facilities for cars, vans, minibuses, coaches, and other vehicles. Suggestions or opinions are welcome at the main reception. Special buses and cars are provided by the tourism department, government authorities and private services. 23 km from national and international airports of Amdavad. 2 km from Gandhinagar railway station. 31 km from Amdavad railway station. 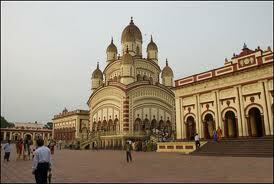 Here is Some Information about Dakshineswar Kali Temple Kolkata India. 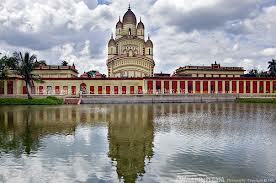 Dakshineswar kali temple is situated on Kalighat road alongside the Vivekananda Bridge north of Calcutta, about 20 km. from BBD Bagh. It is famous for its association with the great religious thinker Ramakrishna Paramahamsa who achieved spiritual vision here and preached the unity of all religions. He used to serve as the head priest here. The temple was built by Rani Rashmoni, a philanthropist and a devotee of Kali in 1855. 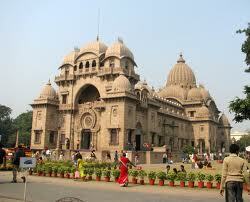 The temple is famous for its association with Ramakrishna a mystic of 19th Century Bengal and Swami Vivekananda. The 12- spired temple with its enormous courtyard has a shrine to Goddess Kali in the center, surrounded by other temples dedicated to Lord Shiva and Radha Krishna. It is a world famous place of pilgrimage. Ramakrishna Paramhansa, the famous spiritual leader is also associated with this temple, as it was over here only that he had worshipped Goddess Kali and formed a rare form of love for her, which is popularly known as maha-bhava in Hinduism. 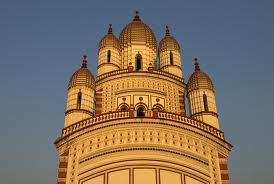 Read on to know about the history of Dakshineshwar Temple Of Kolkata, India. The legend associated with the establishment of the temple suggests that the queen Rasmani was all set to leave for the sacred city of Banaras to worship the divine mother and seek her blessings. During those times, going by boat was the only feasible option, as there were no railway lines between Calcutta and Banaras. But one night before, it happened that divine mother kali appeared in the dreams of Rani Rasmani and instructed her to construct a beautiful temple on the banks of the Ganges River and install her idol in it. She also said that she would manifest herself in the image over there and accept her devotion. 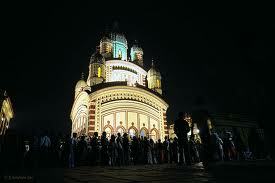 It is one of the largest temples in Kolkata. When India was still groping under the British rule trying hard to come to terms laid down by the English, the first wave of patriotism gripped the brave soldiers of Barrackpur, that shared the same river line where the Dakshineswar Temple would be built, led to the Sepoy Mutiny Revolt in 1857. 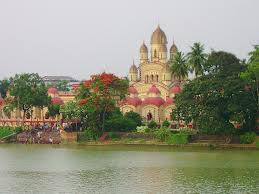 Kolkata was the capital of the country and was then the second largest city of the British Empire only next to London. This new ardour of patriotic fervor soon spread amidst the important people of the city. Among them was the brave and deeply religious Rani Rashmoni who is one of the pioneers to silently revolt against the foreign rule. Dense forest surrounded the area where the famous Dakshineswar temple stands today. It was 300 years back when Durgaprasad Roy Choudhury and Bhavaniprasad Roy Choudhury, members of the renowned Savarna Roy Choudhury family settled here. Yogindranath one of the successors of this family was an ardent devotee of Sri Ramakrishna who later was known as Swami Yogananda. 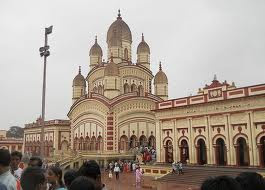 The famous Dakshineswar temple which houses the Goddess Kali was founded by Rani Rashmoni following a dream she saw when she was about to start on her pilgrimage to Benaras. 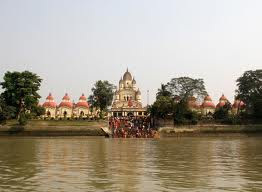 A long term plan of the Rani materialized which she had longed to perform when her husband died with unfulfilled wish of constructing a Kali temple. A dynamic woman, Rani Rashmoni took over the administration of the enormous estate her husband left her. The benevolent administrator, Rani Rashmoni was always in conflict with the stringent British laws and policies. People honored her and loved her for her daring and benevolent spirit. 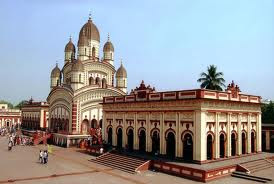 Dakshineswar temple, bathing ghats, a way from Subarnarekha River to Puri, Imperial Library (present National Library) and Hindu College (present Presidency College) are the testimonials to her benevolent nature. The Panchavati, a congregation of five ancient trees, is a spot for peaceful meditation. Here Sri Ramakrishna used to meditate and performed severe penances sitting on the 'Panchamundi (5 skulls) Ashana' - a custome which is mandatory for the 'Tantrika' form of worship. It is 3km. 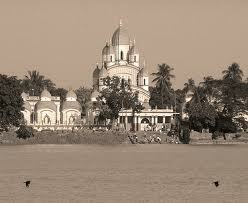 from Dakshineswar temple. The Belur Math is an important place of Pilgrimage includes the main monastery, several temples and the head quarters of Ramakrishna Mission and Ramkrishan Math. By Road: The city of joy is well linked with almost all the cities of India by road. The Esplanade Terminus is the main bus terminus that lies in the heart of the city. The latest development is the starting of Dhaka-Calcutta buses, which are fully air-conditioned and also very comfortable. By Rail: Kolkata is well linked to other parts of the country by railways. There are super fast trains like Rajdhani Express and Shatabdi Express that join Calcutta from Delhi and other nearby places. 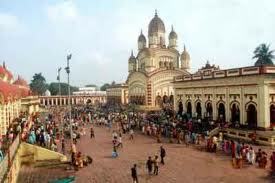 Calcutta consists of two major railway stations; one is located in Howrah and the other at Sealdah. By Air: It is completely accessible by air. There are a number of domestic airlines that connect Kolkata with other major cities of India like Ahmedabad, Bagdogra, Bangalore, Bhubaneswar, Chennai, Delhi, Guwahati, Hyderabad, Jaipur, Lucknow, Mumbai, and Port Blair. Here is some Infrmation about Parthasarathy Temple in Triplicane Chennai India. 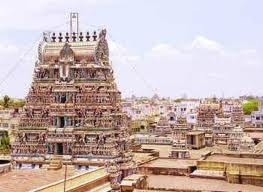 Sri Parthasarathy Temple is one of the 108 sacred Vishnu temples, which are popularly known as Divya Desams in Southern India. Located in the Triplicane area of Chennai, close to Marina Beach, this temple is dedicated to the five incarnations of Lord Vishnu and is one of the two most important pilgrimage places in the city (the other is the Kapaleeshwar Temple, dedicated to Lord Shiva in Mylapore). 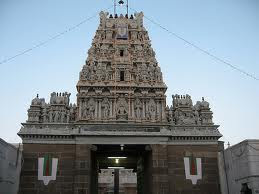 The temple derives its name ‘Sri Parthasarathy’ from its main presiding deity, Sri Parthasarathy or Lord Krishna, an incarnation of Lord Vishnu. In the Mahabharata, Lord Krishna, on Arjuna’s request, becomes his sarathy or charioteer and guide. Arjuna is referred to as parth or brave warrior. Hence, Lord Krishna is also referred to as Parthasarathy or Arjuna’s charioteer. As a charioteer, Lord Krishna goes to the battleground disarmed, and at the end of the war is seen holding a divine conch in his right hand and his left hand is seen pointing to his divine feet. 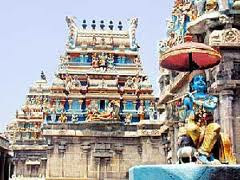 Lord Krishna is depicted in this pose at this temple. His face is marked by wounds left by arrows shot by Bhishma during the Mahabharata. Accompanying Lord Krishna in the inner sanctum are his family members including his consort, Sri Rukmini Thayar, his brothers, son and grandson. His elder brother, Balarama is depicted standing to the right of Lord Krishna’s consort facing North and younger brother Sathyaki is to Lord Krishna’s left facing east. His son, Pradyumnan and grandson, Anirudhan are on the northern side and face south. Such a depiction of Lord Krishna with his entire family is believed to be a rarity. You will also find a shrine of Lord Rama, another incarnation of Lord Vishnu, alongside his consort Sita, brother Lakshman, Shatrugna, Bharat and his devotee Lord Hanuman. In another shrine, Lord Vishnu is depicted as Varadarajan seated in his vahan, Garuda. Other shrines depict Lord Vishnu in a reclining pose as Ranganathar and in a seated pose as Narasimhar. This includes a separate shrine for Andal, one of his 12 azhars or poet saints who sang praises of Lord Vishnu. The temple comes alive during the annual festivities such as Brahmotsavam, Thiru Aadi Pooram and Neerattu Utsavam. 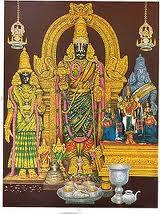 Brahmotsavam, a nine-day festival is held during the Tamil month of Chiththirai (April-May); during this festival the idols of Lord Vishnu and his consorts are taken out in a procession in their vahanas around the temple. Legend goes on to say that Lord Brahma initiated this festival to wash away the sins of Lord Indira, when he killed a Brahmin with demonic characteristics. As killing a Brahmin is considered a sin of a very high order, Lord Brahma carried Lord Vishnu on his head during the special bath ritual. From then on, this festival is celebrated to wash away the sins of the community as a whole and hence a large number of devotees come to the temple on all nine days. 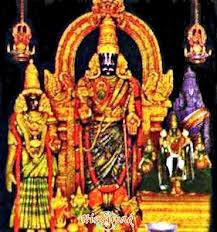 During the Aadi month (July-August), the festival of Thiru Aadi Pooram is celebrated in honor of Goddess Andal, one of the 12 azhars of Lord Vishnu. According to mythology, Andal was the adopted child of a priest and she used to wear the garland before offering it to Lord Vishnu. Her father upon seeing this one day, offered a fresh garland to the Lord, but He refused to accept it. Since then Goddess Andal began to be worshipped as an incarnation of Mahalakshmi, his consort. Vishnu devotee, king Sumathirajan by name had a desire to have the darshan of Lord as the Sarathy of Arjuna in the Kurukshetra battle field. He prayed to God for the darshan which Lord obliged as controlling and managing the rath of Partha-Arjuna. The king begged the Lord to stay in the place in the same form. Perumal appears only with His conch and not the discus. Lord absorbed the arrows shot by Bhishma aimed at Arjuna and thus sustained injuries. The scars are visible even now. Parthasarathi is the procession deity. 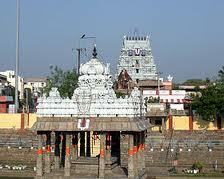 As He grew prominent among the devotees, the temple came to be known as Parthasarathy temple. 10 day Laksharchana festival in February drawing thousands of devotees; 10 day Brahmmotsavam in April; Vaikunda Ekadasi in December-January and new year days are celebrated in the temple. Some festival is celebrated in the temple throughout the year. By Air: The Kamaraj Domestic Airport and the Anna International Airport are located at Tirusulam at a distance of 20 km from the city. By Rail:Chennai is also well connected to all the major cities in India through a wide network of railways. The rail service connects to all the main cities of the neighboring state and the country. By Road:The excellent road network of Chennai makes it easily accessible from other important cities of Tamil Nadu and the neighboring states.